When I was growing up, I knew with certainty what Jewish food was. It was brisket, stuffed cabbage, matzoh ball soup, and everything else my grandmother fed me. It was liver roughly chopped by hand in an aged wooden bowl, glistening with chicken fat and dotted with flecks of burnt onions. It was food that needed special plates and silverware for meat and dairy and the wonder of the magic of pareve, foods that could be eaten with anything. Mostly it was food Grandma had grown up eating as prepared by her Russian-born mother. But what was Jewish to me then was really just a snapshot of one kind of Jewish food – a New York interpretation of Russian shtetl cooking. So what is Jewish food? “The food of the Jewish people is also the history of the Jewish people. The dishes, flavorings, and traditions chronicle the resources of the lands they were exiled to and from,” says author Marlena Spieler in The Complete Guide to Traditional Jewish Cooking. The Jewish Diaspora brought red pepper to Hungry and pumpkin to Venice. 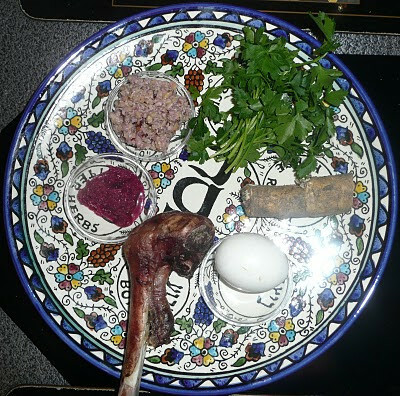 These and other ingredients and cooking techniques influenced the local cuisines where Jews lived just as Jews were influenced by the available foods and prevalent dishes. Challah’s distinctive braid, for example, may have been adapted from a local bread in Germany. Italians still savor a dish from Rome known as carciofi alla giudia (artichokes in the style of the Jews). Spieler’s book features food traditions and recipes from Russia, Poland, Ukraine, Germany, Hungry, Romania, Bulgaria, France, Italy, Spain, Portugal, Greece, Morocco, Egypt, Ethiopia, Iran, Israel, the Middle East, India, Central Asia, China, the United States and Latin America. The food I ate in my grandmother’s kitchen would have been recognized by Jews from Germany and Eastern Europe as distinctly Jewish, although the food might be not sweet enough for the Poles and not spicy enough for Romanians. Ashkenazi food traditions began when Jews settled in the Rhine Valley and spread as persecution drove them further ever further eastward. According to Spieler, it was a cold weather cuisine. Cabbage and cucumbers were fermented into sauerkraut and pickles. Fish and meats were smoked and salted. Meat was scarce and often used as a component of other dishes to make it go further. Beans and grains were plentiful. Once potatoes were introduced they were widely eaten. Sephardic Jews had very different food influences. Those who lived toward northern Spain had food ways that reflected the legacy of the Roman Empire such as grapes, wheat and olive trees. Those in the southern end of the Iberian peninsula were influenced by the occupation of the Ottoman Turks, and incorporated spices such as cumin, cinnamon, nutmeg and black pepper in their cooking as well as rice, almonds, citrus, eggplants, spinach and artichokes, according to Joyce Goldstein in Sephardic Flavors: Jewish Cooking of the Mediterranean. Other cuisines developed independently of these major groups, but the spread of the Sephardim after their expulsion from Spain in 1492 and Portugal in 1497 affected the Jewish food cultures they came in contact with by trade or settlement. Sephardic Jews changed their cooking, too, as they began to learn new regional specialties. As varied as the many cuisines of the Jews are, though, very few dishes can be traced back to the foods eaten in Judea more than 2,000 years ago, according to Gil Marks, author of The World of Jewish Cooking. Among them are Sabbath stews (such as cholent and hamin) and charoset (Passover nut and fruit pastes), but even then the ingredients and cooking methods would be unrecognizable to our ancestors. One unifying factor that has shaped Jewish food is the religion itself, with its dietary laws, home-based, food-centered celebrations and the tradition of according symbolic meaning to some dishes. According to Marks, it is this aspect of Jewish food that creates similarities in our varied cuisines. He points out all Jewish communities use foods mentioned in the Torah as “symbolic ingredients in assorted festival dishes.” Since foods had to be prepared in advance, “vinegar was commonly added as a preservative and often sweeteners or raisins would be added” to balance the flavor, resulting in a tradition of sweet and sour dishes across the Jewish food experience. 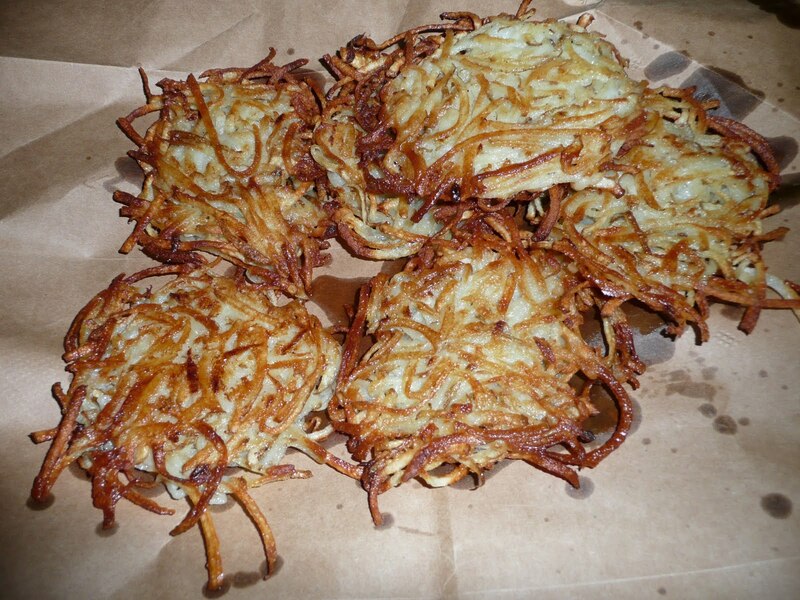 Another example would be cooking dishes fried in oil, such as latkes (Eastern European potato pancakes) or sufganiyot (Israeli jelly doughnuts) as symbolic foods for Chanukah, celebrating the oil that lasted for eight nights. Dietary laws resulted in Jews creating a cuisine that was different from their non-Jewish neighbors and helped preserve a special sense of community, but this differentness also lead to persecution. During the Inquisition, officials used the testimony about the eating habits of newly converted Christians to make sure they had abandoned all Jewish practices, according A Drizzle of Honey: The Lives and Recipes of Spain’s Secret Jews by David M. Gitlitz and Linda Kay Davidson. Preparing Jewish dishes and avoiding pork were seen as proof of unrepentant ways. Penalty for being discovered could be death. The last century has seen other disruptions in traditional Jewish food ways. Many localized food traditions were lost because of the Holocaust. Writer Mimi Sheraton went to Bialystok, Poland, and found that virtually no trace of the city’s famed bialy, a chewy bread roll with onions, had survived the Holocaust. As opportunities for migration to Israel and elsewhere became available, long established Jewish communities in other countries began to dwindle. The survival of many cuisines began to depend on communities that were now scattered. But others have now discovered the many flavors of Jewish food. Israeli cuisine has been influenced by this influx of food ways. Cookbook writers have become amateur historians to track down historic dishes as they worked to preserve the legacies of Jewish cuisines. Translating these recipes had another impact, as the mostly Ashkenazi Jews of North America and Europe began to discover Sephardic and other Jewish cuisines and incorporated them into their Jewish food repertoire. I like to think that as we share our Jewish food heritage we begin to understand the diversity of the Jewish world and people. 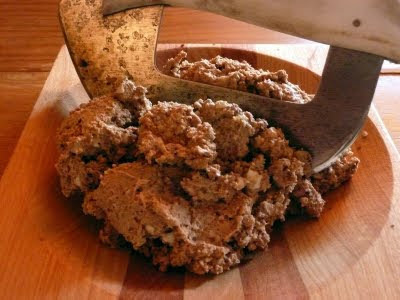 Slathering Yemenite hot sauce on pita bread, making a Tunisian vegetable dish, or eating other Jewish recipes from around the world connects me with Judaism and our shared history as much as when I try to recreate Grandma’s chopped liver. It is food out of our tradition that has become my tradition. To me, that’s what Jewish food is. A condensed version of this essay appeared in the Temple Beth Abraham (Oakland, CA) Omer. About the photos: From top: chopped liver, stuffed cabbage, seder plate (charoset is to the left of the parsley), potato latkes. For more photos and writing about Jewish food on Blog Appetit, click here , including recipes ranging from noodle kugel to sweet and sour pomegranate fish to tzimmes tamales. What a wonderful essay. I couldn't agree more with all you said, and am honored to have been included. also, one reason i feel so strongly and am touched so deeply when i discover or bring back to life a dish from a destroyed community is that in a small way it brings that jewish community back to life. in a small way. there is, as you say, the terrible-ness of seeing as mimi sheraton did: not a bialy left in bialystok! tragic. but bialys are alive in nyc. eat one there and know that we are still alive and well and eating! As usual, an incisive, comprehensive, and always thought-provoking essay from you! Thank you, Faith. Ahhhh Jewish food My grandmother's hot russian meat borscht, for which I have never found a decent reciipe, her chopped herring-which I CAN do. Knishes- not the heavy wrapped version ( have you ever suffered the square deep fried version?-feh! 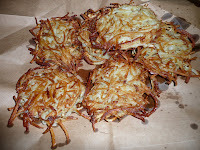 but mashed potato ovals with fried onions filled with hand chopped cooked beef, dipped in matzo meal and fried in a thin layer of oil. Nor can I forget her kreplach, fried with onions, my brother's favorite.And pot roast a thousand different recipes depending on the grandma, gefulte fish, cookies made with oil not butter, home made chrain....the list goes on and on but to be REALLY Jewish food it has to be served by a bubba with an accent who stands over you, serving more and more with the admonition 'eat mommeleh,eat'. Marlena -- it does seem much of this food now exists more out of its "home" environment than in it. Joanne -- thanks so much. I like all of your Jewish cooking mom! a fascinating post about jewish cooking - it is true, you can learn a lot about history and tradition by the food that is eaten.